Update: In the comments, Insect Hooves adds, "OM NOM NOM. I love their Segfault Chicken. And their Short Stack Overflow is to die for. Ooooh, and their 404 Not Pound Cake (foghorn)"
What probably happened here is that when they entered the characters for translation and hit the translate button there was an issue with the translation software. 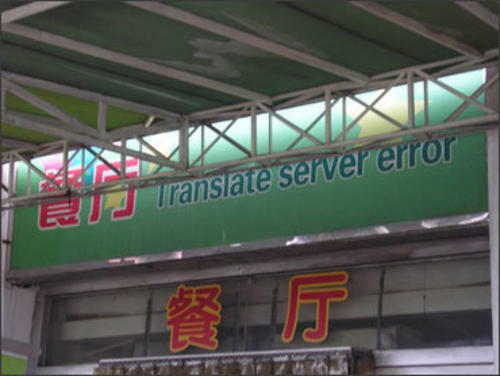 So the resulting error message was 'TRANSLATE SERVER ERROR' instead of the requested translation - classic.